Sears focuses on chondrites, the largest group of meteorites, and on the many theories that have evolved about their formation throughout the centuries. He meticulously traces the theories that researchers have proposed, from the belief that meteorites came from the Moon to their being ejected from volcanoes on Earth. In the process, he provides a comprehensive bibliography of the latest research and a valuable reference guide for students and researchers in planetary science, geology and astronomy. Meteorites contain in them the story of how the solar system evolved. 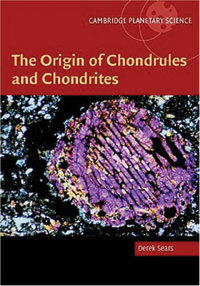 Chondrites, the most common ones, are as old as the solar system, 4.6 billion years. The youngest are the 20 or so meteorites from Mars, a mere 1.5 billion years old. Mass spectroscopy made possible a new discipline in chondrite studies: researchers now could determine their chronology, or the time at which events occurred. The types of events are as varied as the chemistry and physics of the many isotopes found in meteorites.